Well, things are about ready to be transformed along this stretch. We’ll get to some of the more impactful, sweeping development announcements along this stretch in this series of 2018 development favorite posts. But, this renovation project on DeBaliviere of the beautiful 1920’s era corner building at Waterman and DeBaliviere that currently houses a Busey Bank in an important one. It preserves and brings additional mixed uses to an area that was largely stripped of it’s original, urban buildings. This will be an anchor. Now that the loop trolley runs this entire stretch, bringing back buildings on the 1980’s surface parking lots will be a huge win for St. Louis. Many tourists and visitors will see this area and judge us. This is our favorite building along this stretch of road. 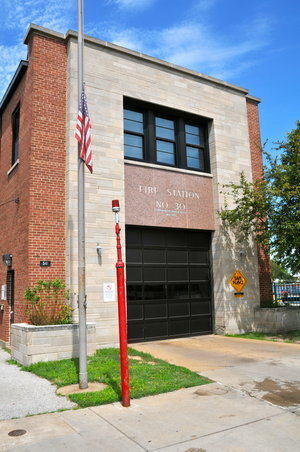 Our second favorite is the firehouse just north of here. The bank building is getting a renovation that will bring market rate apartments and retail…and there is hope that at least part of the parking lot just to the north may be sold for development. This building hugs the corner so well and is a prime example of the skill and art on display in our city. This is the kind of building that must be preserved to but us on the map of most beautiful architecture cities in the United States. I feel that strongly. When more modern infill eventually fills up the underutilized spaces, it will be buildings like this that ground the are and balance it. We couldn’t be happier that this beauty is getting the love it deserves. Blackline Design + Construction is planning to add twenty market-rate apartments and additional street-level retail to the Busey Bank building at 415 DeBaliviere Avenue. The bank will remain a tenant. Formerly used as office space, most of the building has been vacant for the past decade. Plans call for sixteen one-bedroom and four two-bedroom units. The high-end units will range from 650 to 1100 square feet with monthly rents between $975 and $1400. An additional 2,500 square foot retail space will be available on the first floor. I couldn’t be happier to see this corner building finding another new life. We need it. This stretch of DeBaliviere is going to become amazing again. If you read the clues in Johnson’s NextSTL article, much of this stretch was demo’d due to “seedy” clubs. Even the west side nearly fell in the late 1960s-1980s. We have to quit tearing down the buildings and blaming the good urban city for social issues or changing times or judgemental/short sighted ways. The surface parking and 1980’s suburban junk need to go. There is hope. And, it’s good to see this building with construction workers inside bringing places to live and places to work/shop.